Sacred Heart Parish School is dedicated to educating the whole child. We are committed to instilling the ideals of service, justice, and compassion in each of our students. As part of this commitment, we strive to offer enriching experiences that will build our students’ social skills, leadership abilities, and moral awareness, no matter whether they are just beginning their formal education in preschool or whether they are eighth graders preparing for the rigors of high school. Sacred Heart Parish School has been educating students in the Hollister community for 125 years. This strong sense of tradition can be seen in our large and diverse array of alumni, each of whom were impacted by the Catholic education provided at Sacred Heart. 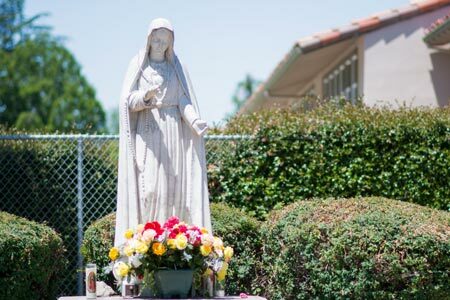 Nestled in downtown Hollister, Sacred Heart seeks to provide our students with a well-rounded and faith-filled education. Together with our school’s families, we help our students to be academically prepared and grounded in gospel values by providing them an environment where they feel safe to grow, learn, and develop. We provide our students with support that strengthens their spiritual and moral guidance. Sacred Heart Parish School is committed to faith, service, and academic excellence. We believe these are the cornerstone values of educating faith-filled and intellectual citizens. Our students’ development is not limited only by the classes they take as part of the regular curriculum. Recognizing the necessity of educating the whole student, we provide opportunities in music, physical education, technology, STEM (Science, Technology, Engineering, and Mathematics), Spanish, and other electives. Through their experiences at Sacred Heart, students will be able to observe life through a creative, analytical, and ethical perspective. In sum, Sacred Heart Parish School is a community committed and rooted in service, justice, and compassion. We welcome you and thank you for being a part of our community.